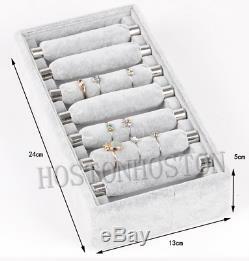 7 Bars Ring Velvet Jewellery Display Box Storage Tray Case Holder Stand Item Description. 24cm x 13cm x 5cm(length x width x depth). Perfectly for rings, up to 50 of rings. Please note that the jewellery is not included. From now on, POSITIVE feedbacks will be left automatically & immediately once we get yours. We care about our valued customers, and will always try to help you. We will answer all questions within 48 hours. If you feel satisfied with our product and service, please do not forget to leave us your valuable feedback. Your satisfaction is our top priority; our aim is to make all our customers as happy as possible whilst shopping with us. The item "New 7 Bars Ring Velvet Jewellery Display Box Storage Tray Case Holder Stand" is in sale since Thursday, April 19, 2018. 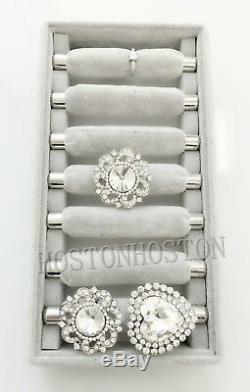 This item is in the category "Jewellery & Watches\Jewellery Boxes & Supplies\Jewellery Display". 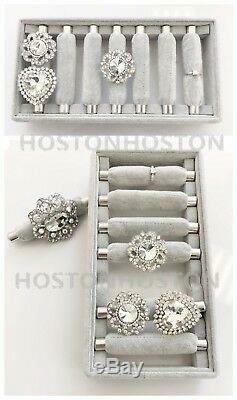 The seller is "hostonhoston" and is located in stockport, Cheshire. This item can be shipped to United Kingdom, Antigua and barbuda, Austria, Belgium, Bulgaria, Croatia, Cyprus, Czech republic, Denmark, Estonia, Finland, France, Germany, Greece, Hungary, Ireland, Italy, Latvia, Lithuania, Luxembourg, Malta, Netherlands, Poland, Portugal, Romania, Slovakia, Slovenia, Spain, Sweden, Australia, United States, Canada, Brazil, Japan, New Zealand, China, Israel, Hong Kong, Norway, Indonesia, Malaysia, Mexico, Singapore, South Korea, Switzerland, Taiwan, Thailand, Bangladesh, Belize, Bermuda, Bolivia, Barbados, Brunei darussalam, Cayman islands, Dominica, Ecuador, Egypt, Guernsey, Gibraltar, Guadeloupe, Grenada, French guiana, Iceland, Jersey, Jordan, Cambodia, Saint kitts and nevis, Saint lucia, Liechtenstein, Sri lanka, Macao, Monaco, Maldives, Montserrat, Martinique, Nicaragua, Oman, Pakistan, Paraguay, Reunion, Turks and caicos islands, Aruba, Saudi arabia, South africa, United arab emirates, Ukraine, Chile.